Patti Austin (born 10 August 1950) is an American R&B, pop and jazz singer. The Real Me is an album by American singer Patti Austin released in 1988, and recorded for the Qwest label. The album reached #7 on Billboard‘s Jazz chart. 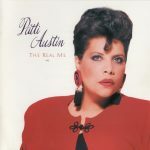 The Real Me was chiefly produced by David Pack, lead singer of the pop group Ambrosia, though Austin served as a co-producer and executive producer on the project. Other duet partners included George Benson (“Moody’s Mood for Love” and “Keep Your Dreams Alive”) and Luther Vandross (“I’m Gonna Miss You In The Morning”). 6 How Long Has This Been Going On?